an open hunger strike. They denounce and condemn the blatant violations of human rights in refugee camps in Lebanon in Arsal city on the 30th of June 2017. The hunger strikers condemn the deaths of a group of Syrian refugees under torture in the Lebanese army detention centers. The hunger strikers demand an open and transparent international investigation into the events that took place in the Syrian refugee camps in Lebanon. 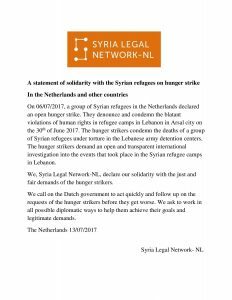 We, Syria Legal Network-NL, declare our solidarity with the just and fair demands of the hunger strikers. We call on the Dutch government to act quickly and follow up on the requests of the hunger strikers before they get worse. We ask to work in all possible diplomatic ways to help them achieve their goals and legitimate demands.